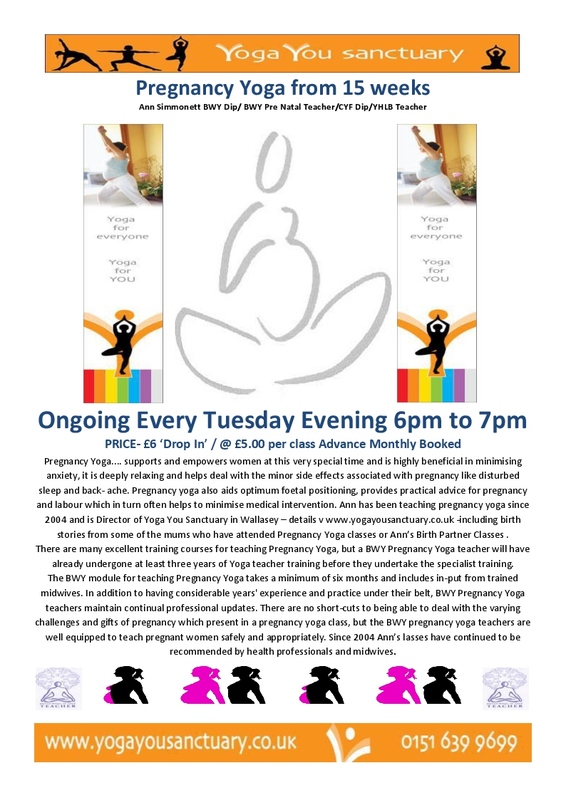 Yoga For Pregnancy Classes: These classes are designed specifically for women from 15 weeks of pregnancy onwards, and are safe to practice even when overdue. A variety of modified yoga postures and breathing techniques are taught with special revelance to pregnancy and the minor complications that can arise. Classes also include birthing positions, use of birthing balls, leg strengthening movements, and finish with a ‘bonding with the baby’ guided relaxation or appropriate meditation. Pre-natal Yoga classes are hugely popular and have proven to be very empowering in helping women cope with pregnancy, childbirth, and post partum in a calm and effective way. And because it helps minimise adrenalin responses, medical intervention in childbirth is often minimised also. 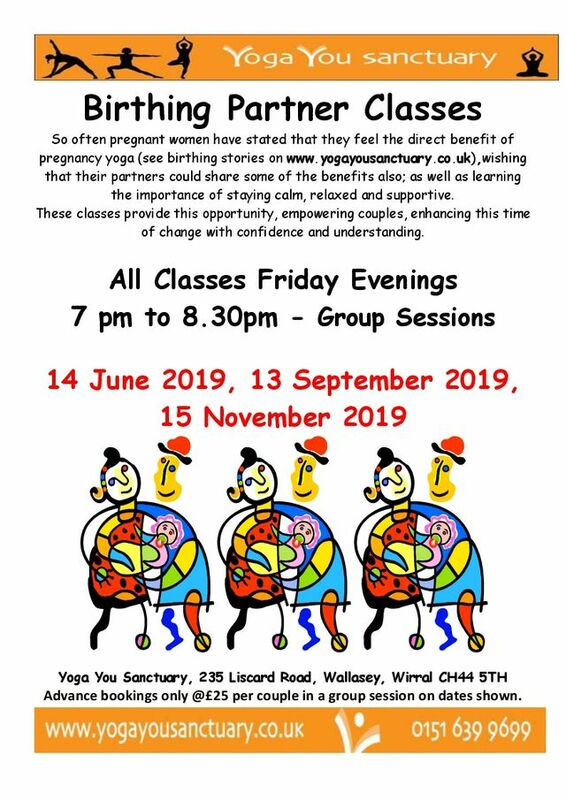 Senior midwife, Paula Brown from the Arrowe Park Hospital Wirral, has reported the benefits to me many times saying that pregnancy yoga has significantly helped many women deal with labour and childbirth in a very effective way, often making the whole process easier for the mother and baby and also the nursing staff. Information is usually given out in pregnancy packs and at ante-natal and labour in motion classes in the hospital. Please see our Classes page for more information. Reduced fees are available only when PAID TO RESERVE FOR FULL CALENDAR MONTH IN ADVANCE @ rate £5 per class. It is usually therefore £20 for a four week month @ one class each week. ‘Reserved Classes’ cannot be carried over to subsequent months or transferred to other people. If you miss a class you may do a ‘Swap Class’ for another class within the same calendar month space permitting. ‘Drop In’ classes space permitting are £6 .. pay on the day and not in advance. *At certain times of the year classes are exceptionally busy so you may wish to call first on 0151 639 9699 to see if there are class spaces available. Our Birthing Partner classes are lighthearted and practical- there is a great deal you can do to help yourselves by jointly learning some of the beneficial aspects of our Pregnancy Yoga Classes. Several of the techniques may help to minimise some of the physical and emotional side effects and health issues associated with pregnancy and really help support the labouring woman in not having to try to remember everything herself, especially if she is in pain . In specific partner work using various reassuring pain & stress management exercises, simple soothing massage techniques we learn to maximise confidence but also acceptance in surrendering to ‘mother nature’ so that you and your partner may share the most precious birth experience you can even in the event of medical intervention. The techniques learned in Pregnancy Yoga Classes and Birth Partner Classes will also stand you in good stead with postnatal lactation, and for both partners to assist in managing energy levels and stress, particularly when there is a sleep debt. Yoga Birthing Partner classes aim to fill you both with confidence, empowerment and understanding in a respectful and supportive atmosphere. Classes are just £25 per couple in a small group session. We have received so many wonderful, magical and inspirational birthing stories from our new Yoga mums that it’s a real honour and delight to be able to share them with you. We hope that you will share in their excitement but also see how beneficial and supportive Yoga can be before, during and after the birth of your baby. Click the banner above, or here, to read just some of the wonderful stories.